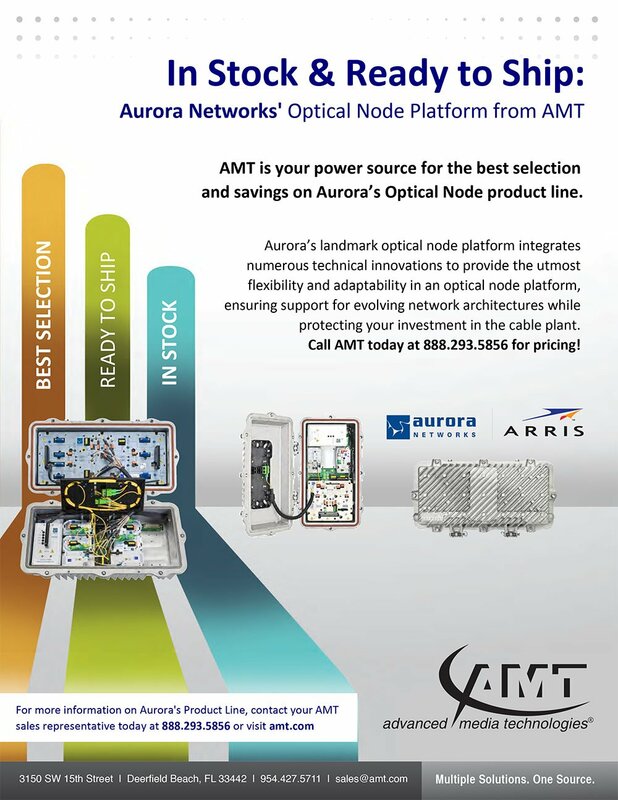 AMT is your power source for the best selection and savings on Aurora’s Optical Node product line. protecting your investment in the cable plant. Call AMT today at 888.293.5856 for pricing! Aurora Networks/ARRIS’s NC4000EG series “second generation” fiber deep node platform has been optimized to provide all of the essential features required by today’s state-of-the-art Fiber Deep (HFC Node+0) architectures that typically serve 50 to 200 homes passed per node. The Aurora Networks/ARRIS NC4000S2 series optical node platform supports a wide range of advanced architectures and is ideal for traditional HFC applications. Advanced Media Technologies – Multiple Solutions – One Source! The ARRIS CM3200 Touchstone® DOCSIS® 3.0 32×8 Cable Modem delivers a full Gigabit per second of raw speed, ushering in a new era of Internet access! The CM3200 is well-suited to the home user –offering the speeds to stream multimedia content to multiple devices and the responsiveness to keep you “in the game” for online gaming. The ARRIS CM820 Touchstone DOCSIS 3.0 8×4 Cable Modem delivers ultra-high speed data access to cable service subscribers homes and businesses. Residential gateway support has always been a concern of the operator. The ARRIS DG3260 distinguishes itself with capabilities to minimize these support needs. Operators are wanting to push the limits on DOCSIS® 3.0 support speeds beyond 1Gbps in today’s competitive world. The ARRIS Touchstone DG1660A DOCSIS 3.0 Residential Gateway combines a 4-port Gigabit Router, MoCA and a Dual Band 802.11n wireless access point into a single integrated device. The ARRIS DG2460 with its superior 802.11ac Dual Band Wireless radios, can deliver this performance while also offering improvements in home coverage above that of other models. Operators are wanting to push the limits on DOCSIS 3.0 performance and the user experience delivered to the customer. The ARRIS DG2470 with its superior 802.11ac Dual Band Wireless radios, USB, and MoCA 2.0 interfaces can deliver this performance while also offering improvements in home coverage above that of other models. The ARRIS Touchstone DG860P2 DOCSIS 3.0 Residential Gateway is an 8×4 advanced gateway product which combines a 4-port Gigabit Router, and a 802.11n wireless access point into a single device capable of supporting both home and small office applications. The ARRIS Touchstone TG1662G DOCSIS 3.0 Residential Gateway combines two analog voice lines, a 4-port Gigabit Router, and a Dual Band 802.11n wireless access point into a single integrated device. Using Intel’s multi-processor technology, the TG1662G can achieve high bandwidth performance without affecting the ARRIS legendary standard of voice quality. Operators are wanting to push the limits on DOCSIS 3.0 performance and the user experience delivered to the customer. The ARRIS TG2472G with its superior 802.11ac Dual Band Wireless radios, USB, and MoCA 2.0 interfaces can deliver this performance while also offering improvements in home coverage above that of other models. The ARRIS Touchstone TG862 DOCSIS® 3.0 Residential Gateway is an 8×4 advanced gateway product. The TG862 combines two analog voice lines, a 4-port Gigabit Router, and a 802.11n wireless access point into a single device capable of supporting both home and small office applications. The ARRIS Touchstone® TM3202 DOCSIS® 3.0 32×8 Embedded Multimedia Terminal Adaptor (E-MTA) delivers two lines of primary line Voice over IP (VoIP), up to 1 Gigabit per second high speed data access, and multiple battery pack options to support telephony service during power outages. The ARRIS Touchstone TM822 DOCSIS 3.0 8×4 Embedded Multimedia Terminal Adaptor (EMTA) delivers two lines of primary line Voice over IP (VoIP), ultra-high speed data access, and multiple battery pack options to support telephony service during power outages (TM822G only). The ARRIS Touchstone TM602 is the next generation residential product family. Like the industry leading TM502 product family, the TM602 delivers two lines of carrier-grade Voice over IP (VoIP) along with High-Speed Data access. The ARRIS SBG6580 SURFboard® Wireless Cable Modem Gateway unlocks the potential of offering innovative ultra-broadband data and multimedia services as well as high-bandwidth home networking. The ARRIS SB6141 SURFboard DOCSIS 3.0 Cable Modem unlocks the potential of offering innovative high-bandwidth data and multimedia services to customers. Utilizing the power of DOCSIS 3.0, the SB6141 enables channel bonding of up to eight downstream channels and four upstream channels, which allows an operator to offer its customers advanced multimedia services with data rates of over 300 Mbps for received data and over 100 Mbps when sending data. The ARRIS SB5102 SURFboard® Cable Modem unlocks the potential of offering high-speed data service to consumers. Consumers can get their favorite websites quickly, download graphics with unbelievable ease and enjoy real-time interactive PC gaming and expand console gaming with broadband Internet access from the cable modem market leader. The ARRIS SB5101 Series SURFboard® Cable Modems unlock the potential of offering high-speed data service to consumers. Consumers can get their favorite websites quickly, download graphics with unbelievable ease and enjoy real-time interactive PC gaming and expand console gaming with broadband Internet access from the cable modem market leader. The ARRIS SB6121 SURFboard DOCSIS 3.0 Cable Modem unlocks the potential of offering innovative high-bandwidth data and multimedia services to customers. Utilizing the power of DOCSIS 3.0, the SB6121 enables channel bonding of up to four downstream channels and four upstream channels, which allows an operator to offer their customers advanced multimedia services with data rates of well over 100 Mbps in each direction. The ARRIS SBG901 SURFboard Wireless Cable Modem Gateway combines an industry-leading cable modem, an IEEE 802.11b/g wireless access point, and an advanced firewall into one compact product. It’s the perfect networking solution for the home, home office, or small business, allowing users to create a custom network to share a single broadband connection, files, networked printers, and peripherals without wires. The ARRIS SBG900 Wireless Cable Modem Gateway, combines an industry-leading SURFboard® cable modem, an IEEE 802.11g wireless access point, and an advanced firewall into one, compact product. It’s the perfect networking solution for the home, home office, or small business users can create a custom network to share a single broadband connection, files, networked printers and peripherals, with or without wires. The ARRIS SBG941/U/E Series SURFboard Wireless Cable Modem Gateway combines an industry-leading cable modem, an integrated four-port switch, an IEEE 802.11b/g wireless point, and an advanced firewall into one compact product. The easy-to-use ARRIS SBV6240 SURFboard® Digital Voice Modem with Lithium-ion battery back-up unlocks the potential of offering innovative high-bandwidth data, up to two lines of IP telephony and multimedia services to your customers. It is DOCSIS® 3.0-based and PacketCable® 1.5/2.0 ready. The ARRIS SURFboard SBV5220 VoIP cable modem with integrated battery backup uses industry-standard signaling protocols to provide high-speed Internet access and telephone service over cable. ARRIS’s next-generation SURFboard SBV5121 Digital Voice Modem is based on ARRIS’s proven cable modem experience. By using industy standard signaling protocols, the SBV5121 provides high-speed internet access and up to two lines of primary line voice-over-IP (VoIP) telephone service over cable’s broadband connection to the home. The Motorola SBV5121’s two telephone lines are terminated in two RJ-11 connectors. The ARRIS next-generation SURFboard SBV5120 VoIP cable modem is based on the ARRIS SURFboard SB5120 cable modem and Motorola’s proven cable modem experience. By using industry-standard signaling protocols, the Motorola SBV5120 provides high speed internet access and telephone service over cable lines directly to a consumer’s home. You know Honeywell’s 5800 Series as the most flexible, convenient and cost-effective wireless security in the industry, with over 70 million devices installed trouble-free. Today, we’ve evolved by taking the 5800 Series to new levels by developing a suite of products that combine security and lifestyle benefits for today’s connected home and business. These solutions are designed to help you earn RMR quicker and move on to the next installation faster—including products that enhance life safety, protect outdoor valuables, prevent theft and enhance end-user awareness. With Honeywell Total Connect Video Solutions, you’ll find that opportunities to grow your business are everywhere you look because you’re not limited to customers that have a security system. All you need is an Internet connection and an AlarmNet® account! Your customers can keep an eye on the interior or exterior of their homes or businesses from any remote location—enhancing their awareness and peace of mind while improving your opportunities for growth. Just picture what it can do for your business! With Honeywell Total Connect Remote Services, you can stay connected and in control of your home or business whenever you want, wherever you are. Control your security system, receive important alerts and true system status in real-time, and control Z-Wave® automation devices. Honeywell Total Connect delivers the features and services your customers want—providing you with everything you need to grow your business! End-users can receive alerts, view live video and control their security systems remotely. Now, they can also control Z-Wave enabled thermostats, lighting, locks and more when using Honeywell’s LYNX Touch 5100 or Tuxedo TouchTM—enhancing both their lifestyles and your opportunity for additional RMR. There’s never been a better time to connect to opportunity! A safer, smarter, more comfortable home… anytime, anywhere! Want to control your security system, lighting, thermostats, locks—even view live video—whether you’re at home or away? Whether you have a new or existing security system, Honeywell and your professional installer can take all of this amazing home control functionality and place it at your Fingertips using the same devices that are already a part of your everyday life—your smartphones, tablets and Internet-connected wireless devices. Welcome to your connected home. Fast, Simple and Secure Installations: Honeywell’s indoor and outdoor IP cameras install easily with WPS (Wi-Fi®Protected Setup) push-button enrollment. There is no IP addressing or firewall manipulation and no security risk to customer networks. Honeywell’s 5800C2W Hardwired to 5800 Wireless Converter is simply the easiest, most economical way to convert existing hardwired systems to Honeywell 5800 Series wireless technology. It can help you retain accounts, close more business and provide your customers with all of the amazing benefits of the connected home and business. Honeywell’s LYNX Touch 5200 all-in-one home and business control system features a bright, 4.7″ full-color touchscreen with graphic icons and intuitive prompts for easy operation. It features live video on demand, Z-Wave® automation capabilities, advanced alarm communications, garage door notification and control, tornado alerts for U.S. and Canadian residents, and remote software upgradeability. The Wi-Fi® module offers the lowest cost alarm communications (including two-way voice) and remote services solution – saving installation time and reducing monthly operating costs.